Blue Crane Digital has been producing DVD tutorials for several years. I reviewed their new 2-volume series for the Canon 7D a few months ago. In fact, I was so impressed with the DVDs, that I looked at the other Canon-specific tutorials. I recently watched the 2009 update to their Canon Speedlite DVD covering the 580EX II/480EX II. 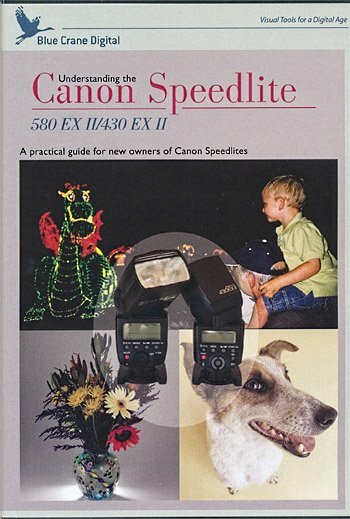 The DVD concentrates on the Canon Speedlites and how the 580EX II Speedlite works with such cameras as the Canon 5D Mark II and the Canon 50D. Although the 480EX II is discussed more briefly with the Rebel series, the DVD does explain that many of the settings are common between the two flash units. Putting a diffuser between the light source and the subject produces a better result. By placing a diffuser between the light source and the subject and then moving the diffuser closer to the subject, the “size” of the light source changes. The light hitting the diffuser “becomes” a larger softer light source. The softer diffused light will now wrap around the subject to light more naturally without harsh shadows. A very simple concept which is explained very well with examples in the DVD. From there, the DVD picks up another concept which can be tough to understand – Slow Sync Exposure and First Curtain Sync / Second Curtain Sync. In a Slow Sync Exposure, the camera will plan on two-steps to properly expose the image. The background subject will be exposed by the camera setting the shutter speed (and depending on the Mode, the Aperture and ISO). The flash will be responsible for the proper exposure of the subject in the foreground. Put both together and you produce a properly exposed image with details in the foreground and the background. When the flash fires (when it is synced) can change the captured image. Second Curtain Sync: the flash fires capturing the car first and then the headlights are captured. Trail of lights appears in front of the car. Overall, the Blue Crane Understanding the Canon Speedlite 580EX II/430EX II is a great DVD to demystify the Canon flash series. It is perfect for someone who gets bogged done with manuals. My only disappointment was that it did not also include references to the Canon 7D and its wireless flash controls. However, this topic is thoroughly covered in 2-volume Canon 7D DVDs. In fact, if you are a Canon 7D owner, you should start with the 7D-specific DVDs. Then, if you want additional information about the Speedlites, think about the Speedlite-specific DVD. Adorama has all of the DVDs at a discount – only $19.99 each: Canon 7D Volume 1: Basic Controls , Canon 7D Volume 2: Advanced Topics and Understanding the Canon Speedlite 580EX II/430EX II.